Send your guests a little piece of the Southern Part of Heaven with the Chapel Hill Postcard. Printed on high quality card stock, this postcard features full trees surrounding the bell tower, with black, white, and grey tones. 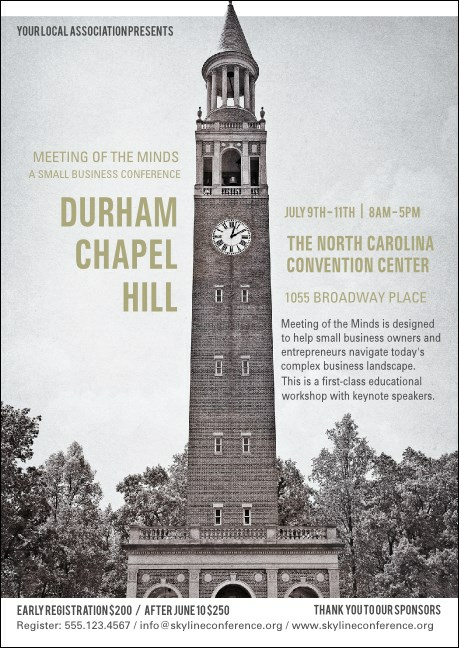 Whether your event is in Raleigh, Durham, or Chapel Hill, start it off right with the Chapel Hill Postcard. Save time and money with a Matching Event Kit from TicketPrinting.com.